In my review of THE PURGE for the Cleveland Movie Blog on its initial release, I was not especially kind. In particular, I noted how the premise seemed implausible, and the film’s tone felt erratic. Subsequent installments in the series, however, have miraculously improved on both those points. Usually sequels get worse, not better, but this is one franchise that has proven that’s not always the case. This is also a rare franchise in which one writer/director has maintained full control over his creation, doing double duty on THE PURGE, THE PURGE: ANARCHY, and THE PURGE: ELECTION YEAR. Only now, with THE FIRST PURGE (and the TV series currently airing on USA Network) has James DeMonaco given up his director’s chair, turning the reigns over to Gerard McMurray. The result is that, once again, the series gets better. As the title implies, THE FIRST PURGE goes back to the origins of the titular concept. For anyone living in a cave the last decade or so, the premise is that for one day a year, all crime is legal. The question I (and I assume others) always had was how did even the authoritarian government depicted in these films manage to get the populace to accept and even embrace such an idea? 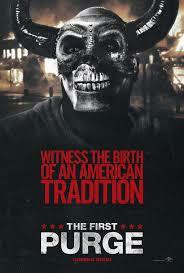 THE FIRST PURGE offers about as plausible an explanation as one could imagine, one which in the current political climate doesn’t seem as far fetched as it might have when the original film was released aeons ago in 2013. This time around we see the original test Purge that was used to sell the idea to the entire country. Not surprisingly, it is people of darker complexion and lesser means who are the guinea pigs. They are given the choice to evacuate for the night, but those who stay will be financially rewarded. Some leave, but plenty still opt to remain, among them Nya (Lex Scott Davis) and her brother Isaiah (Joivan Wade). They could use the money, and it’s not like they have many other opportunities knocking at their door. Nya's ex boyfriend, successful drug dealer Dmitri (Y'lan Noel) also stays behind with some of his crew to protect their turf and their product. And then there's the distinctive looking Skeletor (Paul Rotimi), one of the few residents who is actually looking forward to indulging his darker impulses even more than he usually does. But there’s a problem in the theory put forth by junk psychologist Dr. Updale (Marisa Tomei). Most of the people in the test zone don’t really want to hurt anyone, or even rob their neighbors. And so the government steps in to give them a little nudge. This, in turn, forces Dmitri to reevaluate his own morality. But will it be too late? The whole thing plays like a seventies urban action movie, with the socio political subtext better integrated than in previous entries. Sure, the correlations to Trumpism are many and very much on the nose, but they aren’t wrong. And yes, the inherent contradiction of criticizing violence in a movie filled with it is still there, but for whatever reason it isn't as distracting this time around.